It’s a new year, which means it’s the perfect time for a fresh start! Truth be told, I don’t think you need to wait until January 1 to start working on new goals or to refresh your life. If you passionately want to start a new project in March or August or on December 31, go ahead! But I also think it’s worth it to take advantage of our yearly reminder to take a look at our lives and see what we’d like to change or work toward. If it’s the start of a new year—or if you’re reading this in the middle of the year and just feel a need to refresh your life—here are six ways to do so. Note – Some of the links in this post are affiliate links, which means if you make a purchase through them I’ll make a small commission at no extra cost to you. Thank you for supporting Dreams, etc.! I’ve always wondered how many diets start—and fail—in January. Fresh off the holidays and the abundance of sugar-filled and rich foods they bring, sometimes you enter a new year feeling like you don’t need to eat for the rest of the month, but you need sustenance to live. I’m not going to tell you to start a diet or what foods you should cut out. I don’t know you and what your body needs to thrive. I will say you might want to start adding a few veggies in if you currently lack them in your diet. Movement always helps too. And water. The one thing I can tell you is that your body needs water to thrive and I’ve found making sure I’m properly hydrated always helps to give me a boost. In 2017 I realized I had a lot of clothes that didn’t feel like me so I started to do a little clear out. Each month I’d get rid of a few of those pieces and incorporate a few new pieces. “Your clothes look like you,” my dad told me one day. It was cool to hear that from him, because I feel like me in them, too! And it feels great! Our stuff can really weigh us down. Go through your belongings and honestly evaluate whether or not you want or need something. And be brutally honest with yourself! Yes, you want to read the articles you bought the magazines for, but you haven’t yet. Are you really going to if you haven’t already? Maybe you really want that back massager, but it doesn’t have a place to live when it’s not being used so it’s just become clutter. Maybe it’s time to move it on. If not, what can you move on so that your back massager can find its new home? Pay attention to how your space makes you feel + how it impacts your thoughts. I get it! You have your goals and you’re so excited to get started with them that you want to do everything and make every change Right. Now. Been there! I’ve had those starts to the year. Get up early on January 1 (even though you were up late the night before ringing in the New Year), write a blog post, read the first chapter of Genesis, journal, work on a novel for an hour, work out, edit a poem, get some hobby time in and paint, post on Instagram, read a chapter of a book, yoga it out, spend some time in prayer and… how is it 1 a.m. already? Guess I’ll start working on going to bed earlier tomorrow. It’s not realistic to do All The Things and make All The Changes on the first day. Take a step or two at a time. Your goals will still be there tomorrow. You can’t do everything the first day. Take the first step. They’ll still there tomorrow. How do you refresh your life for a new year? SUCH good advice! We all need a refresher every now and then! Yes, we do! It always feels so good to freshen things up, too! The one about refreshing your space resonates with me. My office is in a constant state of transition and is driving me crazy. With every piece of progress I make I feel so much better! It is! I’ve been purging a lot this year and it feels so good! Love this post, Crystal! Going through my closet always helps me feel rejuvenated! It’s been on my to-do list for a while now! Love the opportunity to refresh in the new year! Me too! It feels so good! 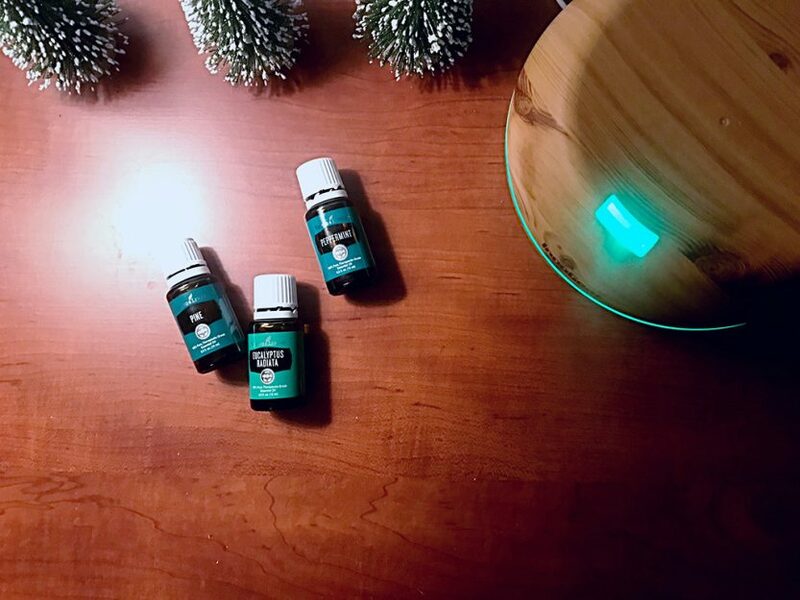 I do want to try using essential oils more this year – I hear good things about them! I’ve been using a blend right before bed that someone put together for me, but I’ll have to look into a diffuser! Let me know if you ever have questions about them! The more I use them, the more I fall in love. Essential Oils have become a recent favorite of mine, love them! They’re a favorite of mine, too! The more I use them, the more I love them! I love this! 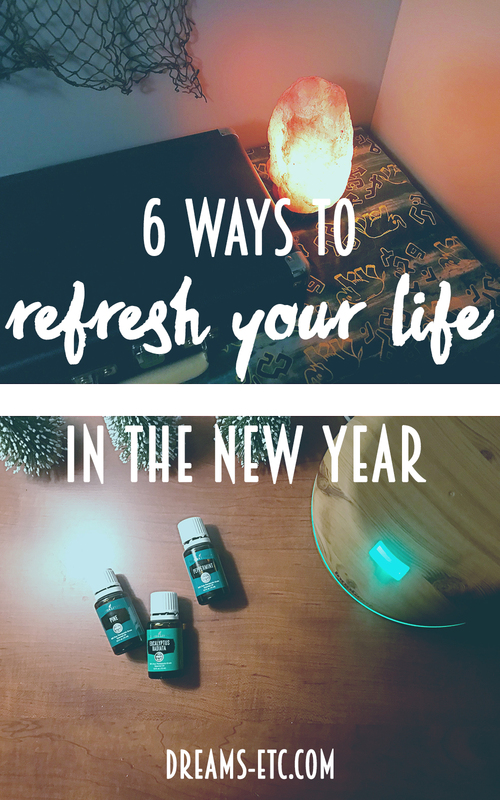 So many good ways to have a refreshing start into the new year instead of rushing in! I am so guilty of not easing into my goals, and waiting until January 1 to really dig into big changes in my life… It’s so inspiring every year that I always try to fix every area of my life all at once! This is a great reminder to start simple–after all, what does it matter which goals you set (and how many) if you don’t keep them? Happy New Year! Exactly! I always like to rush into them, too, but I just burn myself out when I do that. I don’t want to do that again this year. These are such great words of wisdom! I agree, it’s easy to get excited about a new year and new goals that we take on too much all at once and become disheartened when things don’t pan out. It’s definitely better to ease in to everything. I’m aiming to drink more water this year and I think I’m about due for a closet clear-out. Happy New Year! We’re hopping on the minimalizing train over here and it feels so good to declutter clothes and all the random things that tend to accumulate. Such great tips! Decluttering really does help clear your mind! Love this! Yes, it does! It’s amazing how helpful it can be! I feel like just reading this put me at ease! Great tips and I am 100% on board! Love these tips! I recently bought a few crystals to place in my bedroom! I just know this is the year that you turn ME into an “oily girl” too! LOL! I feel like drinking water is such a basic thing and yet, we all need reminded to do it. I’m definitely a person who craves a cold Pepsi every now and then and when I get on a kick, I have to make a concerted effort to drink water. Yes to all of this! And I agree, doing it in baby steps is the way to go. I used to try to do everything all at once and my older wiser self has realized that isn’t the best way to achieve goals. Start small and build up, right? Me too! I always want to rush into them, but I must be getting older and wiser too because I’ve realized that’s not fruitful for me. I just get overwhelmed and burn out. Slowly adding them in this year has been so much more productive for me! I definitely have started a few of these like drinking tons of water, clearing out my wardrobe and living space, but I need to incorporate burning essential oils throughout areas of my home. I’ve literally done 3 of these things already this year so far! 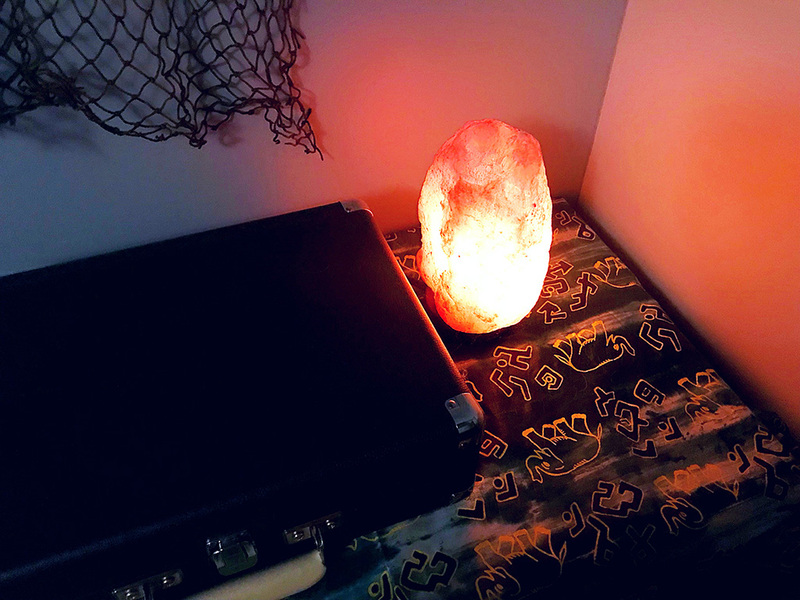 I bought a diffuser, and a salt lamp! They are already doing wonders. And I just recently went through my wardrobe (which I try to do a couple times a year) – these are some great ideas! That’s awesome! I love how they make a room feel! I hope you’ve been able to refresh your life for the new year and that it’s been helpful for you! My sister got me a diffuser for Christmas 🙂 I really want to clear out all the extra stuff we have stuffing in closets and under the bed. I kinda want to donate my whole wardrobe and start fresh too. Not that I have much but, it would be nice to do that! Love this post, Crystal! I’m starting to think that a new space (or at least a cleaner, more minimalist living area) can make a world of difference and I’ve started decluttering, but by bit (glad that Bryan is finally joining me, too). It feels so good!! Happy happy new year; here’s to a wonderful 2018!! Yes! I’ve been going for a cleaner, minimalist space, too. Although, my idea of minimalist is that everything has a space and if it doesn’t have a space it has to go. As I’ve been doing this I’ve realized that the stuff that doesn’t have a space hasn’t even been used. I’ve just had everything in unorganized piles. Time to go! And like you said, it feels so good! And yes! Diffusing feels so good! Salt lamps do, too! Great tips! My biggest goal this year is to drink more water, which I have been doing! Next is getting the house more organized! Those are great goals! I’m glad they’re going well so far! Great tips!!! Baby steps is always easiest for me! Thanks, Taylor! Me too! I just need to remind myself of that a lot! I love your point about easing into your goals! I feel like I always have so many goals that I get lost in the clutter! Me too! I either rush them and burn out or forget about them. I keep going back to them now as I slowly incorporate them into my life and I feel like I might be more successful with them than I have been in past years.